It’s fair to say that the accessories industry for premium smartphones, such as the iPhone, is going from strength to strength year after year. As devices become more and more sophisticated, and therefore start to hold more residual value, consumers are looking for new and tested methods of accentuating the functionality of the device and keeping it in top notch condition. As part of CES 2015, Antenna79 has introduced a brand new range of cases that it claims will not only add visual appeal to Apple’s iPhone 6 and jumbo-sized iPhone 6 Plus, but will also provide a healthy boost to received signal strength and potentially improve battery life by up to two times. The Reach79 brand of cases are not only designed and manufactured with aesthetic appeal in mind but also come with military grade drop protection thanks to the inclusion of a high impact resistant protective material used throughout the product. 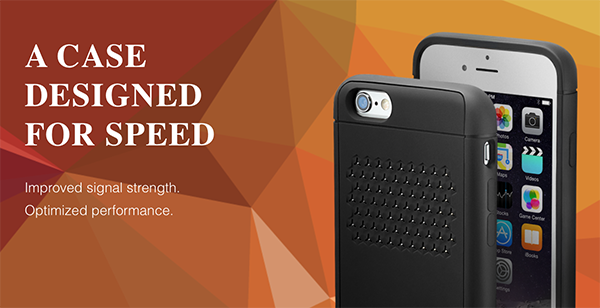 Powered by patented antenna technology, Reach79 cases are the first performance-enhancing smartphone cases designed for speed. Each case is embedded with a micro-thin, gold-plated antenna that works to increase your smartphone’s signal strength so your phone can do more for you. – David Vigil, CEO of Antenna79. The additional benefits that are marketed alongside the case, such as faster download speeds and improved battery life, all result from a stronger, more reliable connection to the cellular network provided by the micro-thin antenna. Increased connection reliability means that the iPhone will not have to continuously poll for network coverage with the tangible benefit to the user being that less battery will be used because of that. As part of the design and development process Antenna79 have put the Reach79 cases through strenuous testing at CETECOM, which is a CTIA accredited area that has confirmed the benefits of the cases. 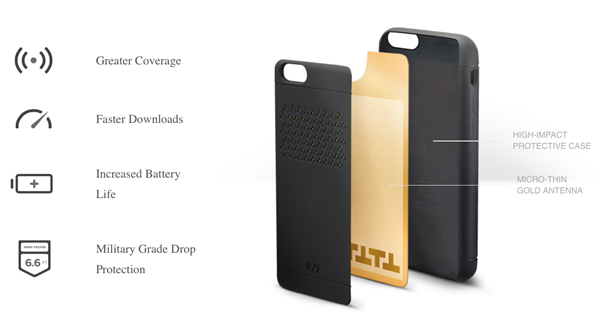 The new cases are available immediate directly from the Reach79 website, starting at $59.99. It is worth noting that signal strength and battery longevity received will vary on an individual basis and depends on external factors like the amount of usage and the carrier involved. Additional colors will be offered to compliment the initial range later in the year. Head over to reach79.com to grab yourself a case immediately. Got one for free for a “trial run”. I like the case in terms of protection and style. Haven’t really noticed a big difference in connection speed though. The site that they have you run the speed test never seemed to get past uploading stage for me. Overall it’s a great case though. But for $60 I’d rather get an Otterbox Defender. I own a 6 Plus. In radios, double signal strength is equal to 3 dB. 1 dot is about -120 dB and 5 dots is around -85 dB. I second that, good sir! and when you drop your phone, it breaks. No thanks, Ill take functionality over looks anytime. Didn’t we already destroy the “stick on antenna” concept, years ago? Doesn’t work, can’t work, if anything, it wrecks your reception. Why is this comment section a month behind?